Checkpoint Charlie, originally uploaded by tgtwb. Check! Point your gun at Charlie! He's the American soldier at the American sector of the border (guardhouse)! Ha! Ha! I swear this is bloody tacky... That photo of the "anonymous" American and on the opposite side, an "anonymous" Ruskie. Actually, the name Charlie derived from the coded letter C the military uses. 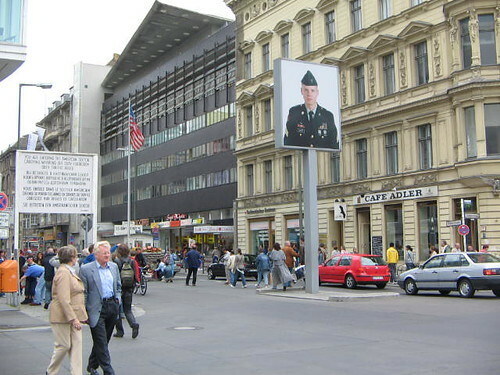 Checkpoint Charlie, the most popular of all border checkpoints connecting East and West Germany. This was the name given by Western Allies (US is one of them) during the Cold War, and located at the junction of Friedrichstrasse. A hugely popular landmark and tourist attraction, CC also has various sidewalk cafes that you can rest your feet over a cup of coffee including the famed Cafe Adler, which is right at the checkpoint (so you can look straight into East Berlin while enjoying your poison!). The attraction also houses a museum for tourists and visitors to learn more about the history of the checkpoints during the cold war, including fantastic souvenirs like t-shirts and postcards for keepsake. You can't miss this... I know its a little touristy, but you haven't been to Berlin if you haven't been to The Berlin Wall and Checkpoint Charlie! The Best Laid Travel Plans For 2009? Silk Air... Smooth As Silk? Not! My December Savings On KM!